Assignment What factors enabled the Vietminh forces to triumph over the French at Dien Bien Phu? Background Dien Bien Phu, the climactic battle between French and Vietnamese Communist forces (called the Vietminh) after World War Two, took place at the town of Dien Biên in northwestern Vietnam. 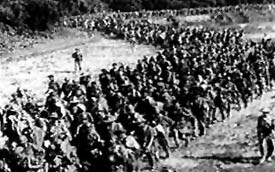 The defeat of over twenty-thousand French troops on 7 May 1954 after a fifty-five day siege of the camp led directly to the division of Vietnam into two countries. The French defeat led immediately to the surrender of French claims in Indochina. While the siege was taking place, representatives of France, the Soviet Union, Great Britain, the United States and several Asian nations met at Geneva to discuss ways to end the fighting. The conferees decided to divide what had been called French Indochina into three nations: Cambodia, Laos and Vietnam (with Vietnam temporarily divided at the 17th parallel into northern and southern administrative districts pending unification elections scheduled for July 1956). In its final statement, the conference recognized the sovereignty, independence and territorial integrity of Cambodia, Laos and Vietnam. The election mandated by the Geneva Conference was never held, in part because it was accurately feared that the nationalist-Communist leader, Ho Chi Minh, would come to power. Thus, north of the 17th parallel a new Communist government led by Ho Chi Minh came into existence, while in the south a semi-democratic regime increasingly relied on U.S. support. 2 March 1946, Ho Chi Minh was elected president of the Democratic Republic of Vietnam (France recognized an autonomous North Vietnam within French-controlled Indochina). 23 November 1946, French navy bombarded port of Haiphong in order to stop the flow of arms into the city. 28 December 1946, French imposed martial law in Indochina. 19 May 1947, Vietminh troops attacked Saigon. 10 September, 1947 Ho Chi Minh refused French peace terms. 9 October 1947, French troops attacked Tonkin. 7 February 1950, Western powers formally recognized the French-supported regime of Bao Dai in Vietnam (a week after USSR recognized Ho in the north.). by 1951 open war between French and Vietminh had spread to all of Indochina (10 April 1953 Vietminh invaded Laos.). 29 November 1953, French airborne troops captured Dien Bien Phu. 14 March 1954, Vietminh besieged Dien Bien Phu. The base was well-fortified and defended by crack troops, but it could only be reached by air. 7 May 1954, Dien base captured, nearly 20,000 French killed or captured. 20 June 1954, armistice agreed in Indochina. July 1954, cease-fire in Geneva provided for the basic division of the country and internationally supervised elections to decide on reunification. Vietminh to withdraw from Cambodia and Laos. 2 September 1945, Declaration of Independence of the Democratic Republic of Vietnam (note how the text began with a quote from the American declaration of independence). March 1946, Agreement on the Independence of Vietnam in which the French Government recognized the Republic of Vietnam as a free state, forming part of the Indochinese Federation and the French Union. With regard to the unification of the three Ky (Nam Ky, or Cochin China, Trung Ky, or Annam, and Bac Ky, or Tonkin), the French Government undertook to follow the decisions of the people consulted by referendum. 7 February 1950, the United States recognized Vietnam, Laos and Cambodia and accorded diplomatic recognition to those governments. 8 May 1950, the United States agreed to extend Military and Economic Aid to the area. 24 May 1950, the American Chargé d'Affaires at Saigon wrote about the Economic aid program. 29 January 1951, a Memorandum of the Conversation, by the Assistant Chief of the Policy Reports Staff (Barnes) was drafted. 30 January 1951, President Truman and the French Prime Minister held a second top secret meeting on Indochina. 21 July 1956, The American Secretary of State, John Foster Dulles, provided the American Response to the Geneva Declarations. 3 November 1954, the White House issued a statement explaining the purpose of the Mission of the Special U.S. Representative in Vietnam. Recommended Books On France's war in Indo-China, see: Philippe Franchini, Les guerres d'Indochine (1988); J. Dalloz, War in IndoChina, 1945-1954 (?) and Ellen Hammer's The Struggle for Indochina 1945-1955 (1966). On the battle, in particular, see: John Nordell, Jr., The Undetected Enemy: French and American Miscalculations in Dien Bien Phu, 1953 (1995); Howard Simpson, Dien Bien Phu: The Epic Battle America Forgot (1994); Peter Batty, Battle for Dien Bien Phu [videorecording] (1991); Jacques Dalloz, Dien Bien Phu (1991); Denise Artaud and Lawrence Kaplan, eds., Diên Biên Phu: l'Alliance atlantique et la défense du Sud- Est asiatique (1989); Melanie Billings-Yun, Decision against War: Eisenhower and Dien Bien Phu, 1954 (1988); Alain Ruscio, Dien Bien Phu: la fin d'une illusion (1986); Erwan Bergot, Les 170 jours de Diên Biên Phu (1981); Peter Poole, Dien Bien Phu, 1954: The Battle That Ended the First Indochina War (1972); Bernard Fall, Hell in a Very Small Place: The Siege of Dien Bien Phu (1966).